Would you like to set up a quick ‘n’ dirty voucher code system for your business? Perhaps you want to experiment with discounts and offers, and need a way to measure the sales of a particular product or service. Using Twitter and the Twitter API you can customise the website embedded widgets feature to display a single Tweet which acts as a discount code. Using a thirds party app such as Future Tweets you could set up a new code to display automatically every day of the year. As a marketer you could sell this service to other businesses. If you are a business, you could implement it yourself. Would you like to know where these sales are coming from exactly? Perhaps you’re running numerous ads in newspapers as well as websites, and you’d like to make some quick distinctions between what seems to be performing the best. It’s all very well letting customers call up and provide a discount coupon code, but often these codes are months old. 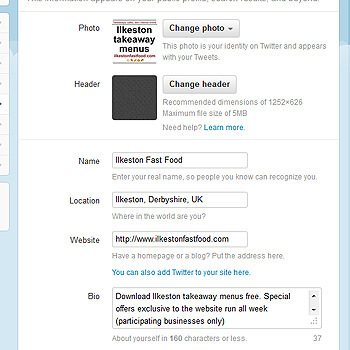 With the Twitter codes it ensures that customers are viewing the Twitter feed or website. Because you would only accept the most recent code, it ensures customers are not using old codes. It means customers cannot pirate/rip off codes. 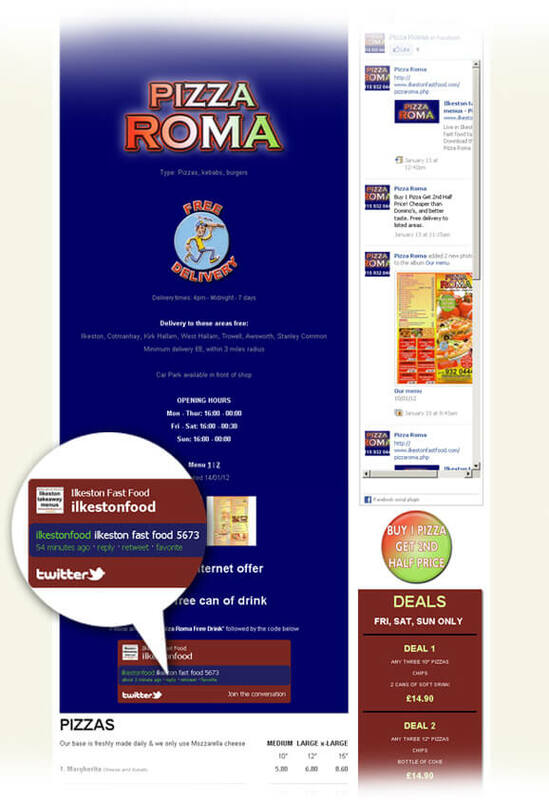 In the example below I’ll show you screenshots from a web page on a local fast food menu directory. The discount voucher codes are exclusive to the website and encourage repeated visits and orders. It lets the person answering the phone and taking the order know where and how the customer is using the menu. Every Friday the codes change and have been programmed to do so at a specific time. Future Tweets is the third party Twitter app that allows this. Future Tweets can be programmed several years in advance. Each Tweet must be totally unique so as not to violate the Twitter guidelines (No recurring Tweets are allowed). 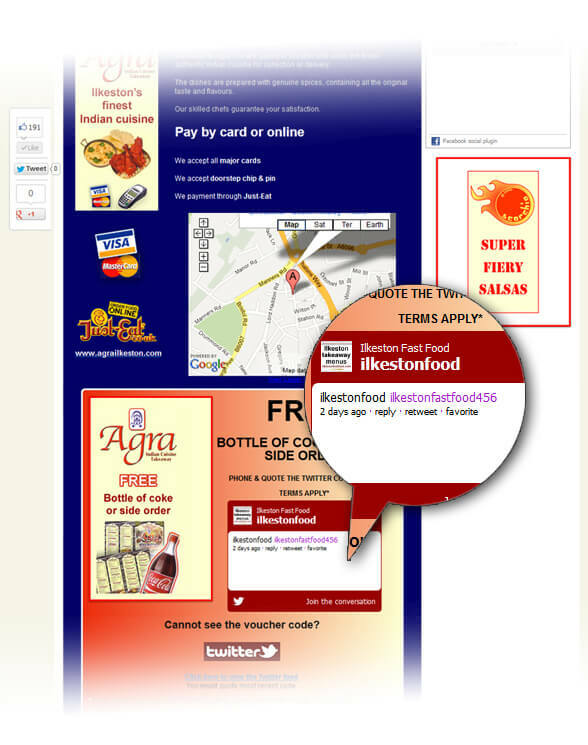 As you can see below, the codes are displayed in a Twitter feed widget and customised somewhat to match the site colour scheme. 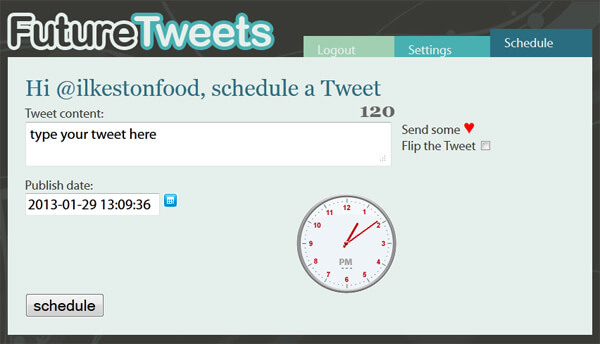 Remember – the Twitter widget is configured using the API to show one Tweet only. With the system I am showing you here, the offer displayed on the website can remain or change while the codes are continuously published. It is a flexible way to market special offers without having to commit to thousands of printed leaflets.You can test and refine at will. Businesses receiving orders or appointments by phone are the best suited. It would be best for high volume/low value tasks, goods, services etc. Create a Word doc table list of all the voucher codes. The business owner will need this so they know what codes are valid on what date and for how long. Because you will have programmed Future Tweets to automatically update on a given date at a specific time, you will need to include that information. 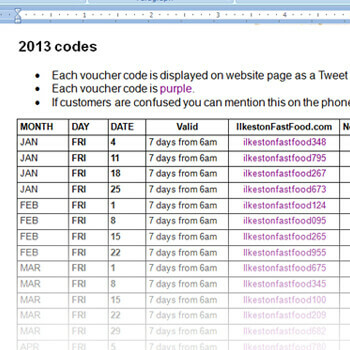 In the example above, each Twitter code/Tweet on the web page is valid for 7 days from 6am each Friday. Do as you like for yours, but make sure the person taking sales orders has this information on hand. You’ll need this list for the Future Tweets app. Any errors, problems or cross referencing is much easier when you are organised. Create a Twitter account for the voucher codes. Nothing else can ever be Tweeted through this account except the codes. You do NOT want to accidentally have a extraneous Tweet update appear instead of the voucher code. 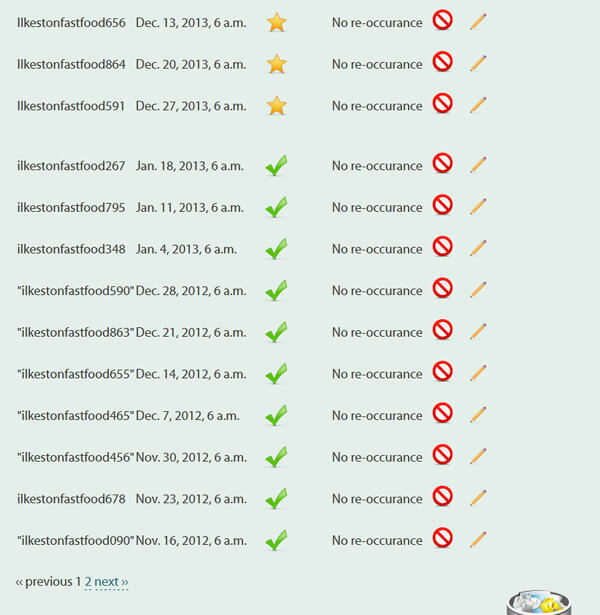 This would wreak havoc on your embedded Twitter widget on the website which ought to be showing the voucher codes ONLY. A tip: If you have a gmail account you can have two Twitter accounts using the same Gmail account.It might be logistically convention for you to do this. Twitter sees a difference between “[email protected]” and “[email protected]” so you can always experiment and see if you can run two accounts from the same email. Go to Future Tweets and log in/authorise the app. You must first be signed into your chosen Twitter account that you want the Tweets to appear under. Make sure it’s the correct account! Click the “Schedule” tab and paste in your first voucher or discount code. Ensure the time and date matches exactly that from your prewritten list from Step 1. Every code must be unique. You will need to set the time and date for each Tweet. This is the tricky part but assuming you have already taken some care over this you can refer to your list of codes with confidence. The timeline widgets provided by Twitter can be customised to show only one Tweet. The Tweet which will be displayed will always be your most recent Twitter update. This Tweet will serve as the voucher code. If you refer to Step 1, you can see I set it to change every Friday at 6am – yes that’s 6 in the morning. Better for the widget to update when no one is likely to be ordering fast food! You don’t want codes to be updating during a busy period. Once you have the actual timeline widget set up under your Twitter account, you’ll want to create some custom embed code which references that widget. To get the Twitter widget to display a single most recent entry from your Twitter timeline, see the code below. All you need do is add your Twitter username. Change the size and colour scheme as you please. 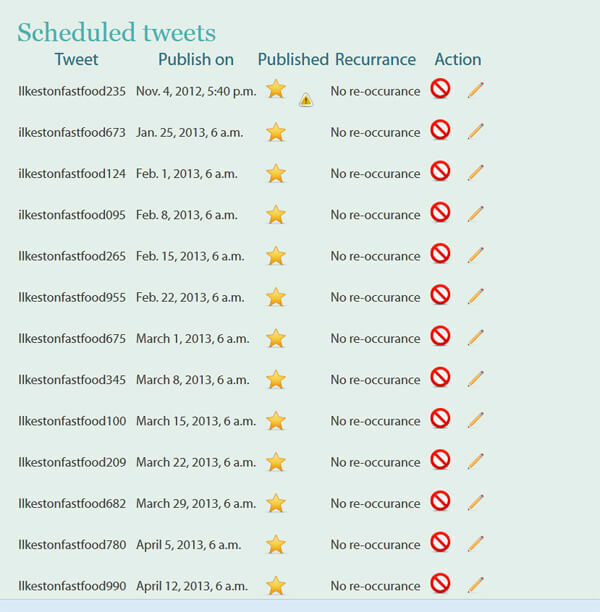 Successfully published Tweets have a green tick next to them while scheduled Tweets display a gold star. If you make changes, ensure sure you update the list of codes in the offline Word document you created in Step 1. If you see the exclamation icon next to a Future Tweet, investigate and find out what is causing it. 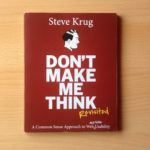 The most common problem is that a duplicate has been published already. You can edit Tweets any time. The Twitter voucher system has so much potential and is very powerful. Offering or using a system such as this can really drive sales for a small business. You may eventually wish to move on to something more sophisticated, such as an online checkout like Magento or OpenCart which offer voucher codes. But for someone wanting to test on a budget, there is absolutely nothing wrong with customising Twitter. It’s a very flexible tool. Check and double check the Twitter codes being published are the same as the ones in your schedule document. The person taking orders over the phone for the business needs to be able to refer to a list of voucher codes. Make sure every code to be published by Future Tweets is unique. If there are two identical codes, it will cause a hold up. If you’re offering this service to local businesses, charge a reasonable flat fee every week or month.